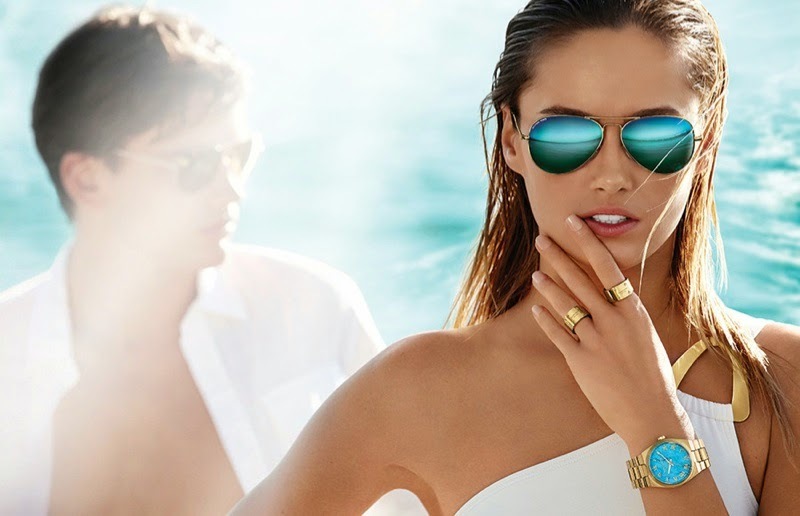 I am pretty much sure you all have seen this image from the Michael Kors Spring/Summer 2014 Campaign. ...But I am not sure if you got that much addicted to it as I did. (Frankly, it even forced me to get back to my blog, that I haven't done for a while). What can I say...? Beautiful photo-work by Mario Testino. It explains it all - you want to have it, own it, buy it, wear it, possess it. It gives you a spirit of relaxing vacation in St. Tropez or Monaco. Healthy tan, high-contrast white dress, massive gold accessories and...enigmatic, mesmerizing blue sunglasses! I think, that's exactly the answer why I love this print so much - I was mes-me-ri-zed. In other words, if I can be more figurative, if these gorgeous sunglasses would be a guy (obviously, a handsome one), I would definitely marry him! Totally! Without a second thought! And so I am trying to do. Yes, I am trying to find a good pair of sunglasses with a reflective optical coating 'to marry' them once and forever (or at least for this summer). If you want the result - well, I am still on the hunt... but I think that eventually I will get back to my favorite 'Kors-ies'. They were almost the only sunglasses that didn't make me (and not only me) look like a flying insect (yuck!). Seriously, dragonFly, butterFly, whateverFly, but clearly not a TESSfly. Yet, we all must be the one!